Today only at 1:00 pm Eastern Time, you can buy discounted 2-day Universal Studios Hollywood tickets through Daily Getaways. You can get four 2-day tickets to Universal Studios Hollywood for $313 through Daily Getaways. If you bought 4 adult tickets ($109 each) from the Universal Studios Hollywood website you’d pay $436. So you’d save $123 with this deal! This is a good deal, but, you can find other discounts on Universal Studios Hollywood tickets. Or you could save your cash and redeem 42,800 American Express Membership Rewards points for 4 Universal Studios Hollywood tickets valid for 3 days. However, that’s not the best use of your American Express Membership Rewards points. You can buy discounted 2-day tickets to Universal Studios Hollywood at 1:00 pm Eastern Time today through Daily Getaways. 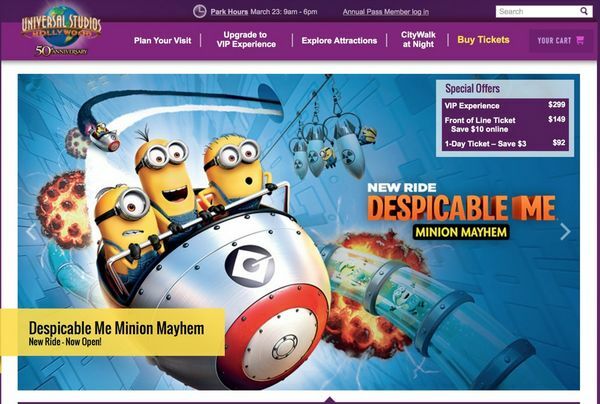 This deal will save you $123 over buying tickets from the Universal Studios website. But there are other ways to save money. You could also use American Express Membership Rewards points. Although, that’s not a good use of your points. That’s because you’ll get more value transferring American Express Membership Rewards points to certain airlines and hotel partners. You can see my review of Friday’s Daily Getaway deal here.